Ancient Sanskrit word Vishwa (विश्व) literally means universe or world. Vishwa also refers to complete, entire, all or whole. Reference of Vishwa is found in the Epic Unadi-Sutra (उणादि-सूत्र) where Vishwa refers to all or everyone. This word is also referenced in Riga Veda (ऋग् वेद) and Atharv Veda in which Vishwa means whole, entire or universal. Vishwa is also mentioned in Upnishad (उपनिषद्) and Mahabharata (महाभारत) where Vishwa denotes omnipresent. This name is also found to be referred in Markandey-Puran (मार्कण्डेय-पुराण) as a class of deceased ancestors. Vishwa is a very popular name in India. As per social media, Vishwa is used by more than 1350people in India as the name of their kids. Vishwa is a somewhat popular name in the USA. 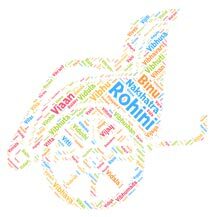 Vishwa is used by nearly 75 people in the USA as the name of their children. In our opinion, Vishwa is a unique name with a unique meaning attached to it. Vishwa is also a short and stylish name. Vishwa Mohan Bhatt is Grammy-winning Hindustani classical music instrumentalist who plays the Mohan Veena. Wishwa Thulasi is a 2004 film. Vishwa Fernando is a Sri Lankan first class cricketer. Vishwa Mohan Kumar is an Indian politician. General Vishwa Nath Sharma, was the 15th Chief of Army Staff of the Indian Army.